It is the ability to execute smooth, accurate, controlled motor responses (optimal interaction of muscle function). Coordination is the ability to select the right muscle at the right time with proper intensity to achieve proper action. Coordinated movement is characterized by appropriate speed, distance, direction, timing and muscular tension. It is the process that results in activation of motor units of multiple muscles with simultaneous inhibition of all other muscles in order to carry out a desired activity. 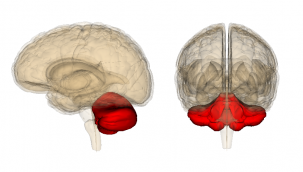 The cerebellum is the primary center in the brain for coordination of movement. Volition: is the ability to initiate,maintain or stop an activity or motion. Perception:in tact proprioception and subcortical centres to integrate motor impulses and the sensory feedback. When proprioception is affected it is compensated with visual feedback. Engramformation:is the neurologica lmuscular activity developed in the extrapyramidal system. Research proved that high repetitions of precise performance must be performed in order to develop an engram. Require coordinated movement of small muscles (hands, face). Require coordinated movement of large muscles or groups of muscles (trunk, extremities). Examples: include walking, running, lifting activities. The ability of the visual system to coordinate visual information. Received and then control or direct the hands in the accomplishment of a task . Examples : include catching a ball,sewing,computer mouse use. The shoulder is abducted to 90o with the elbow extended, the patient is asked to bring tip of the index finger to the tip of nose.Finger to therapist finger: the patient and the therapist site opposite to each other, the therapist index finger is held in front of the patient, the patient is asked to touch the tip of the index finger to the therapist index finger. the patient alternately touch the tip of the nose and the tip of the therapist's finger with the index finger. The patient asked to do rapidly alternating movement e.g. forearm supination and pronation, hand tapping. The patient with his elbow fixed, flex it against resistance. When the resistance is suddenly released the patient's forearm flies upward and may hit his face or shoulder. F) Buttoning and unbuttoning test. C) Rom-berg test: Ask the patient to stand with heels together. Swaying or loss of balance occurs while his eyes are open or closed. Activities are broken down into components that are simple enough to be performed correctly. Assistance is provided when ever necessary. The patient there fore should have a short rest after two or three repetitions,to avoid fatigue. High repetition of precise performance must be performed for the engram to form. When ever a new movement is trained, various inputs are given, like instruction(auditory), sensory stimulation(touch) ,or positions in which the patient can view the movement (visual stimulation) to enhance motor performance. FRENKEL’S EXERCISES: Frenkel aimed at establishing voluntary control of movement by the use of any part of the sensory mechanism which remained intact, notably sight, sound and touch, to compensate for the loss of kinaesthetic sensation. The ultimate aim is to establish control of movement so that the patient is able and confident in his ability to carry out these activities which are essential for independence in everyday life. Start fast then slow movement. Start by proximal then by distal joints. Start by symmetrical then asymmetrical movement. The patient must see the movements and verbal feedback is very important. The patient is positioned and suitably clothed so that he can see the limbs throughout the exercise.A concise explanation and demonstration of the exercise is given before movement to give the patient a clear mental picture of it the patient must give his full attention to the performance of the exercise to make the movement smooth and accurate. The speed of movement should be rhythmic through counting. The exercise must be repeated many times until it is perfect and easy. speed of exercise: quick movements require less control than slow ones. range of exercise: Wide range of movements, in which large joints are used. complexity of the exercise: exercise should be starting with very simple movements and gradually advance to more complicated ones. Flex and extend one leg by the heel sliding down a straight line on the table.Abduct and adduct hip smoothly with knee bent and heel on the table.Abduct and adduct leg with knee and hip extended by sliding the whole leg on the table .Flex and extend hip and knee with heel off the table . Flex and extend both legs together with the heel sliding on the table. Flex one leg while extending the other.Flex and extend one leg while taking the other leg into abduction and adduction. One leg is stretched to slide the heel to a position indicated by a mark on the floor. The alternate leg is lifted to place the heel on the marked point. From stride sitting posture patient is asked to stand and then sit .Rise and sit with knees together. In stride standing weight is transferred from one foot to other.Place foot forward and backward on straight line. Standing in a normal comfortable posture. Standing with one foot exactly in front of the other in tendon (toe of one foot touching heed of opposite foot). Arm position may be altered in each of the above postures (that is arm at sides, over head, hands on waist) . Displace balance unexpectedly (with carefully guarding patient). Standing and then alternate between forward trunk flexion and return to neutral. Standing with trunk laterally flexed to each side . Standing to test the ability to maintain an upright posture without visual feedback. Standing in tandem position from eyes open to eyes closed. Mechanical test Instrumentation used to assess coordination Pivot turning mat Frenkle's mat Side turning mat.